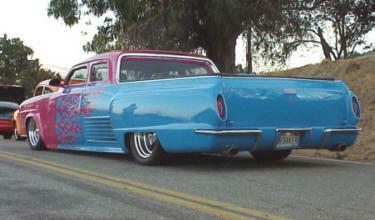 This amazing custom "Studemino" belongs to Ernie Belcher, Jr. of Torrance, California. Ernie's rod started life as a 1948 Studebaker Champion 2-door sedan. The front clip was replaced with 1950 bullet nose parts and the truck bed is from a 1964 Chevy El Camino to which Studebaker sedan fenders have been added. Power comes from Chevrolet 350 V8 connected to a GM R700 automatic transmission and a Chevy El Camino rear end. The front end is Mustang II with disc brakes and the car rides on 16" Billet wheels. Amenities include power steering, power brakes, air conditioning, sound system with CD player, digital gauges, Jaguar bucket seats, and center console adapted from a Chevy Camaro. 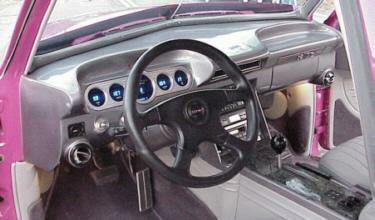 The dashboard came out of a 1959 Chevrolet, rear bumpers are from a Chevy Corvette, and tail lamps are 1954 Chevy. Ernie Jr. built this fine rod with Ernie Belcher Sr. More than 1800 hours of work went into the building of this fine machine. 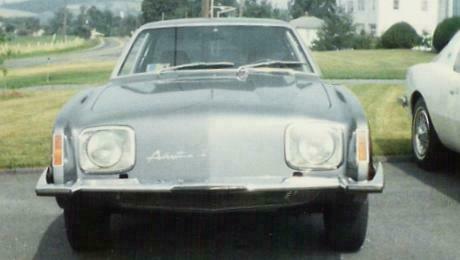 The square headlights indicate that this is a late production Avanti. All 1963 Avantis as well as early 1964 models had round headlights. Studebaker tended to make running changes to the Avanti so the distinction between 1963 and 1964 models is somewhat muddled. The Avanti was built on a modified Lark convertible chassis. It was the last design that Raymond Loewy Associates did for Studebaker. The Avanti set numerous speed records at Bonneville as part of its promotional campaign. 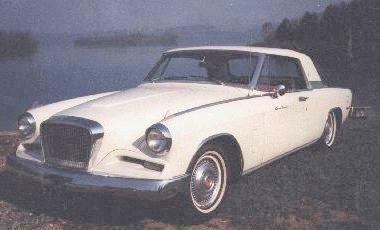 Studebaker produced 4,643 Avantis over two years before production ended in December 1963. 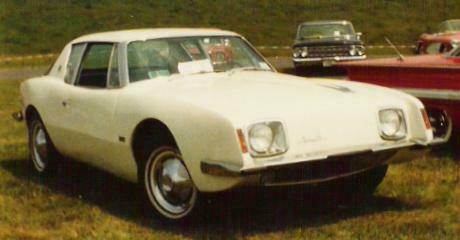 Other than the "II" emblem on the front panel, it is difficult to tell this early production Avanti II from a Studebaker Avanti. When Studebaker moved automobile production to Canada, South Bend auto dealers Leo Newman and Nate Altman bought the rights to the Avanti along with a building from the Studebaker plant. By 1966 the Avanti was back in limited production with a Chevrolet drivetrain. The Avanti II was hand built and production typically ranged from 100 to 200 cars per year more or less. One feature of the Avanti II was that it could be ordered in virtually any automotive paint color and interior material at extra cost. The Avanti II gradually evolved to look less like the original car with the addition of crash bumpers, an optional large glass sunroof, Recaro seats, and other modifications. This Dinky Toys DY24 1955 Studebaker Commander Hardtop is from my Stude toy collection. Unlike most of the Dinky Toys that I am familiar with, it was made in France rather than in England. French Dinky Toys seem to be a bit harder to find than English ones. The French Dinky line also included a Studebaker M Series truck in a number of variations.